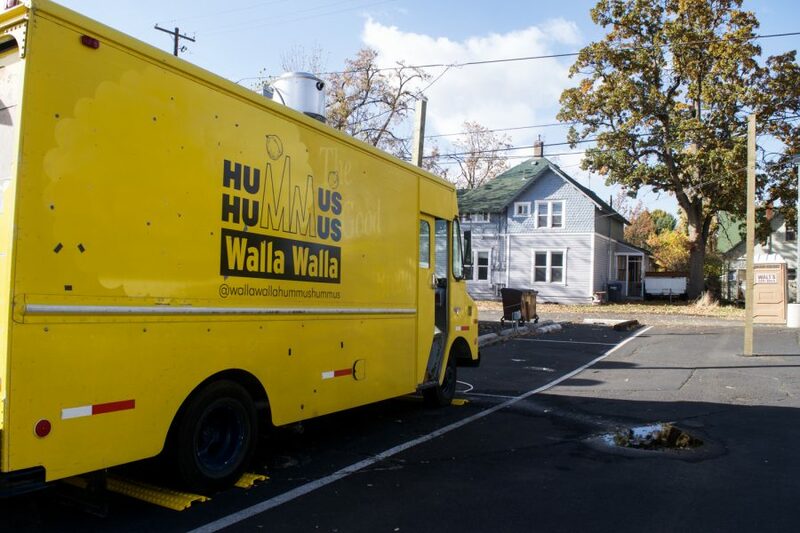 Hummus Hummus opened this year, serving delicious Syrian food to the Walla Walla community. The food truck is open Thursday-Saturday, 11:30am-5pm. There is a new way to indulge in everyone’s favorite spread as Hummus Hummus — the newest addition to the fantastic Walla Walla food scene — has arrived to the Gut Grub Lot on 509 E Main Street with plenty of fresh chickpeas and tahini. The truck is a culmination of the lifelong dream of Gibran Shamoun, whose spouse, Elyse Semerdjian, is an Associate Professor of Islamic World/Middle East History at Whitman. Hummus Hummus began business with three pop-up events over the previous summer to gauge enthusiasm of the Walla Walla community. Marc Goff, a junior sociology major and the owner of the Harvest Smoothie Co., played a large part in the actualization of Hummus Hummus. Semerdjian and Shamoun were touched by Marc’s generosity. “What Marc did was honestly the kindest thing anyone has ever done for us,” Semerdjian said. 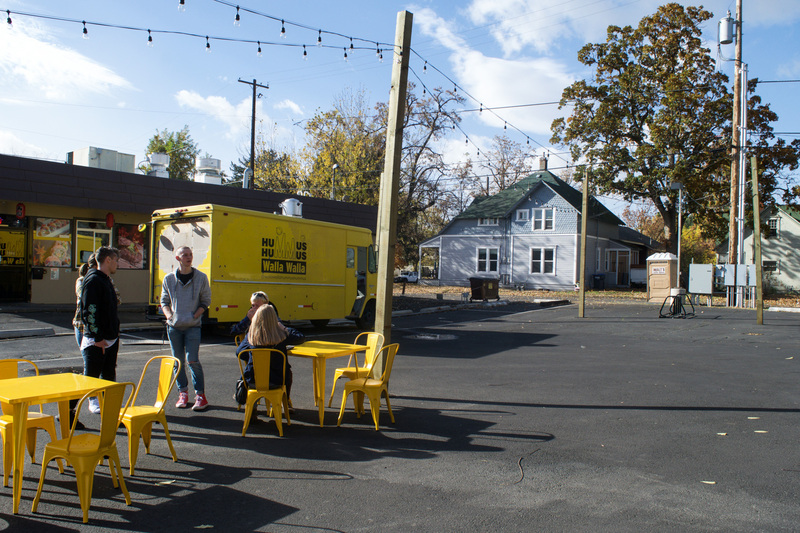 Because of people taking action to their aspirations, an empty parking lot is transforming into cultural and tasty phenomena. Along with hummus and pita, Hummus Hummus serves a falafel sandwich and salad. Shamoun, being a immigrant from the one of the oldest cities in the world, Damascus, was inclined to share the history of the dishes. The history of falafel, like many traditional dishes, is different depending on the nation. “Every country has a different recipe: Egyptians use fava beans, which is not bad, but different. While the Lebanese put a lot of spices, and they like it green, which means [the Lebanese] like to use parsley or cilantro. Then there are the Syrians, the Syrians, well they use primarily chickpeas,” said Shamoun. At Hummus Hummus, Shamoun likes to cook his wife’s recipe. The history of hummus offers less flexibility. In Arabic, the word “hummus” means “chickpea.” Traditionally, the phrase for hummus dip in Arabic is “hummus bi tahini” meaning “chickpeas with tahini,” which does not offer much flexibility in the recipe. “If there isn’t chickpeas or tahini in it, you are not eating authentic hummus,” said Semerdjian. The Hummus Hummus food truck, now proudly serving Syrian cuisine, is run by Professor Elyse Semerdjian and her husband Gibran Shamoun. Although the recipe may be simple, the proportions are difficult to get right, and Shamoun and Semerdjian spent a lot of time manufacturing the perfect hummus bi tahini. Influenced by Semerdjian being a History professor at Whitman, Shamoun decided nine years ago that he would live in Walla Walla. After living most of his life in Damascus, Shamoun and Semerdjian deeply missed aspects of the culture that they had left behind, primarily traditional Arabic food. “We started [making falafel] because we felt nostalgic for Arabic food, so we started to build our own [falafel] recipe,” said Shamoun. 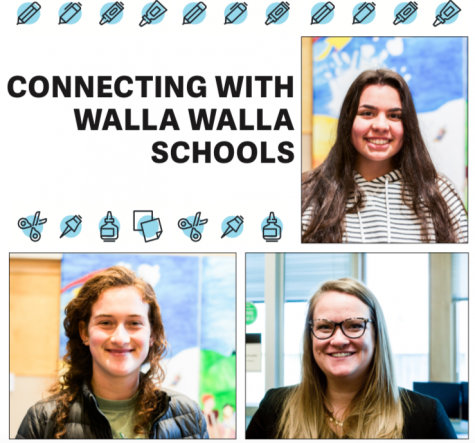 Not too long after Shamoun arrived he also noticed a lack of diversity in Walla Walla. “There is no Arab community in this town,” Shamoun said. To compensate for the lack of quality hummus, Shamoun decided to incorporate a taste of his culture into the Walla Walla cuisine. Shamoun had assistance when devising the hummus recipe. When I interviewed Shamoun about Hummus Hummus, he kindly invited me into the food truck. This was a wonderful experience for a multitude of reasons. First, Shamoun began our interview by offering me a falafel, a gift I gladly accepted, and then he introduced me to his father-in-law, Nick. English is Shamoun’s third language, so Nick assumes the responsibility of being the cashier while Shamoun spins around in the small but organized food truck kitchen making falafels and hummus. Since Shamoun had never made hummus before coming to America, he relied on his family. Although, this was not a risk for Shamoun for he had the support of his wife and father-in-law. “[Elyse] and her dad Nick do the best hummus,” said Shamoun. Shamoun was appreciative of the lessons that Nick and his wife offered to him. “As [Nick] said, I used to do the worst hummus, but now I don’t believe anyone [in Walla Walla] can make hummus better than me,” said Shamoun. “Now he truly does make the best!” said Nick. The great taste of the hummus can also be attributed to the locally sourced ingredients. As, oddly enough, Walla Walla is an ideal location to make Arabic food. “All the chickpeas we use in our dishes are grown locally and organic. We buy directly from Walla Walla farmers,” said Semerdjian. “Almost half of the [Walla Walla’s] chickpeas are exported, with most of [the chickpeas] going to the Middle East,” said Semerdjian. The traditional Arabic food located just across the street from the Baker Ferguson Fitness Center holds a special emotional attachment and hopes to resonate with Whitman and Walla Walla community members alike. The timing of installation of the Hummus Hummus food truck could be perfect, as the popularity of both hummus and falafel has dramatically increased within the United States in the last decade. Contemporary dietary restrictions do not affect hummus or falafel recipes to be altered. Both dishes are vegan, with chickpeas being the primary ingredient. Eating hummus can seem like a relatively innocent task, and it is, but only for the uninformed. Junior Bash Haidar is especially happy for the Hummus truck’s opening, as it reminds him of his home country and gives students an avenue to purchase from a local source. “I enjoy [Hummus Hummus] not only because it reminds me of my home country, Lebanon, but it is also a great alternative for many of my friends here that I know that buy Sabra,” said Haidar. Haidar discourages Sabra hummus, as the company supports the Israeli occupation of Palestine. As an usually warm fall turns into winter, Hummus Hummus has to contemplate how to move forward. The most pertinent issue is keeping the water pipes insulated. “We must figure out how to protect the pipes during the winter time, otherwise they will explode,” said Shamoun. However, if this problem is to be solved, Shamoun would like to have Hummus Hummus continue to serve falafel and hummus over the colder months of the year. “I would like to work in the winter, because a falafel is a perfect cold weather food. Once you eat it, you will get warm,” said Shamoun. As for now, Hummus Hummus is opened from Thursday to Saturday from 11:30 a.m. to 5 p.m.. 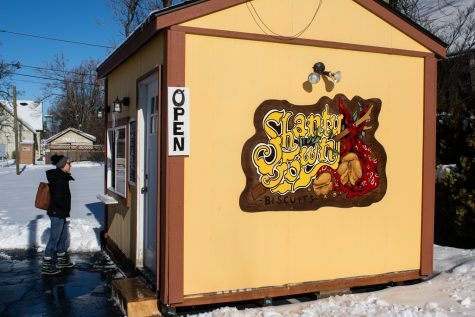 Hours of operation may increase as well as an extension to opening up the truck for meals on Wednesday if business continues to be successful. When craving a falafel or hummus look no further than 509 E. Main Street to find a delectable, local and healthy meal.